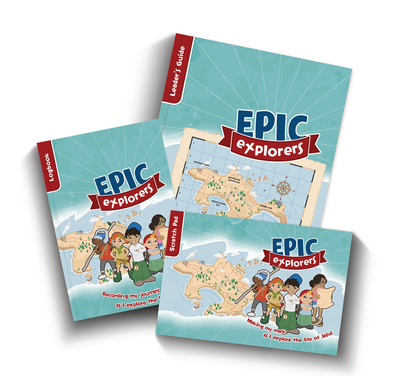 Epic Explorers is a brand-new addition to the Christianity Explored range, specially designed for 4-11s. The five flexible sessions can be used for a holiday club, after-school club, or as an opportunity for children to invite friends to their church group. Epic Explorers takes children through Mark's Gospel as they explore the life of Jesus together. On the way they will discover who Jesus is, why he came, and what it means to follow him. This sample pack contains everything you need to evaluate Epic Explorers. It includes 1 x Leader's Guide, 1 x Epic Scratch Pad (4-7s) and 1 x Epic Logbook (8-11s). The Leader's Guide includes session outlines, talks, Bible discussion groups, and a wide range of linked games, crafts and activities. There are also suggestions for family events to help you build links with parents as well as their children. The Leader's Guide is designed to use alongside the two children's booklets: the Epic Logbook for 8-11s, and Epic Scratch Pad for 4-7s. 8.3" x 11.7" x 0.6"
Over 20% cheaper than buying the components separately. Epic Explorers (Christianity Explored for children) is a really great resource. Easy to use with a host of good ideas to choose from. I am using the resource to form the teaching content to a new, once a month, mid-week Christian discipleship group for children. So far the children are really enjoying the content and it feels like we are starting at the right level, which is brilliant. Thank you Epic Explorers! We have just used this excellent resource for our annual Holiday bible Club. The book is full of lots of ideas that tie in with the teaching points. There are so many that you will not use all the craft and games ideas. The children really enjoyed the workbooks as well which were pitched at the right level and prompted some good discussions. The song is catchy but an easy to use backing track would be helpful for churches without musicians. The children also enjoyed the drama sketches, although these could easily have been left out or improved. Thanks for your review Isabel. Music for the Epic theme song will be available next year from the All Souls children's choir. In the meantime, you might be able to use this excellent recording from the team at St James, Muswell Hill. I thought this was one of the best holiday club resources I've used. It was ideal for the week before Easter, but would be great anytime. Easy to use and had a good flow and layout of the material in the book. There are plenty of good ideas for crafts, games and activities, quizzes, and good ideas for teaching. Personally would have liked a cd or a download of the theme song to have been available along with some of the powerpoints and artwork for advertising. Apart from these minor things Epic Explorers is a great resource one of the few holiday clubs I've done and got to the end of a week and thought I'd like to do that again sometime. The material is easy to use, well laid out and flexible for a number of different uses (holiday club, after school club, weekend away etc). The example talks are faithful, easy to repeat and engaging for the children. The child work books that accompany the material are great. We had positive reviews from parents on children understanding and repeating what they learnt. Epic Explorers gets 4/5 however as some of the optional extras are a bit random and not all the resources that are meant to be online are available yet. Excellent resource for Children's Bible club Sunday School etc. Resources fun for children and take them through Mark's gospel clearly. This has been an excellent resource for our 4-11 Friday Club. The children have been excited by the activity books and enjoyed the Explorer theme. The books have given a great opportunity to talk to the children about what they believe and to check it out in the Bible. There are plenty of ideas for teaching the stories, learning the memory verse and quizzing the children on what they have learned. There are also craft and games ideas. This resource would be great too for a Holiday Bible Club. In fact I was quite sorry that we could not use a lot of the ideas, due to lack of time...so if you are looking for Holiday Club material, this would be brilliant! There is a theme song with music, though not a CD, so you would need a musician to play the music and teach it to the children. The Family service proved to be a good opportunity to review the material with the parents who had been invited. Unfortunately some of the powerpoints mentioned in the leaders book are not yet available on the website but there are plenty of good materials free to download.